Despite my one and only son being taller than me, I’m joining in on Kid’s Clothes Week Challenge, an initiative by Elsie Marley suggesting sewing an hour a day of sewing for your children. When I proposed the idea his eyes lit up. 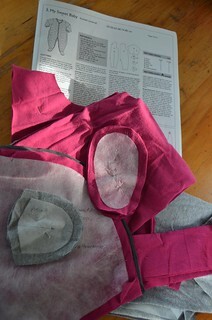 A final refinement of the Colette Negroni Shirt pattern using an old bedsheet. 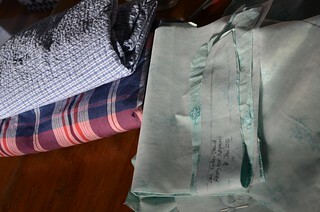 And then the two checks fabrics above. I can use the same thread colour for these, so it should be a quick production run approach. On Sunday night I sewed up the muslin and he tried it on for size on Monday night. The sleeves were still a little long for his liking. When I reduced sleeve length, the sleeve cap was too shallow for my liking so I will make the final tweaks to the pattern and have a big cutting out of shirts tonight. PJ pants using the pattern from BASIC of LOCKSTITCH SEWING MACHINE of MENS CLOTHES ebay link and comparisons to the hole ridden pair he won’t give up. On Monday night I sewed up the PJ pants and they are done awaiting a photo. Tiniest Niece Isabelle will get some knit body suits and a cute cardigan. 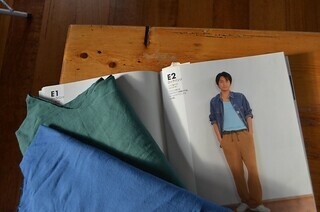 I’ve got a stockpile of preloved t-shirts to salvage fabric from. I’ll touch base with my sister in law about what is at the top of her ‘needed/ wanted’ list. Over the weekend, before the challenge started I cut out all the above. Recently Zac joined in on the sewing of a shirt, and we have made some more modifications to the pattern around sleeve width, collar stand height, and whatever you call the width of the collar in technical terms. Very practically he suggested a test garment before I attack the final two shirt pieces with scissors. I’m quietly delighted he’s interested in me making clothes for him, and has also shown an interest in doing some of it himself too. Another part of the strategy will be to use the slow cooker and leftovers to free up my sense of space in the evenings. This entry was posted in sewalong by kirsty. Bookmark the permalink.